1st - 4th May 2009. The Fourth Burke and Wills Conference was held in the heart of Melbourne between Friday 1st and Monday 4th May 2009 at the Royal Society of Victoria building at 9 La Trobe Street, Melbourne 3000. 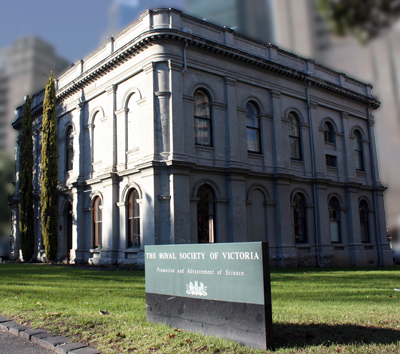 The Royal Society of Victoria is the only Royal Society with its own premises and this historic building is celebrating its 150th Anniversary this year. It is a very significant place, as it is the spot where the expedition assembled prior to departure and also where the remains of Burke and Wills were laid in state prior to Victoria's first state funeral. The conference program consisted of a variety of excursions and visits over four days between Friday 1st and Monday 4th May. The Conference presentations were on Saturday 2nd and Sunday 3rd May and there was a dinner on the evening of Friday 1st May. Friday 1st May 2009- A choice of three excursions. Dr Beverley Wood,	Cathy Miller	and	Kevin Molloy. The Australian Manuscripts staff provided an overview of the Library's holdings of Burke and Wills material and related items, and discussed how these can be easily accessed. Some items from the collection were available for viewing in the Manuscripts Collection. The group will then visited the Cowen Gallery and also the Changing Face of Victoria exhibitions where paintings, written documents and artifacts are on public display. At City Square we inspected Charles Summers' Burke & Wills Monument at its present location; note the nearby site prior to the restoration in 1993, then walked to the original site at the intersection of Collins and Russell Streets. After a further walk up Collins Street, we checked out the location of Summer's studio and the Melbourne Club. A nearby historical information board showed Collins Street and the monument at the intersection. We walked along Spring Street, opposite Parliament House is the Princess Theatre. Near here was home for the monument after it was removed to make way for the tramways system in Collins Street. Development of the Melbourne Underground Loop Railway saw the monument moved to a temporary site in the Carlton Gardens opposite St Vincents Hospital. After inspecting this site we walked to the Royal Society of Victoria building. Excursion 3 - Burke and Wills at the National Herbarium of Victoria. Dr Josephine Milne, Catherine Gallagher and the Collections staff provided an overview of the botanical specimens collected during the expeditions associated with Burke and Wills. Selected specimens, now part of the State Botanical Collections, were available for viewing. 19.00 Dinner at the Pumphouse, Fitzroy. Saturday 2nd May 2009 - Conference Day 1. Sunday 3rd May 2009 - Conference Day 2. Monday 4th May 2009 - A choice of three excursions. David Corke,	Cathy Miller and Kevin Molloy. Excursion 5 - Historical Burke and Wills Walk.